Miners adjust to the New Order's dominion over highsec in a variety of ways. Some enthusiastically embrace the new regime and immediately send in their 10 million isk mining fees. Others need to hit rock-bottom first; only after they are torn down completely can they be rebuilt into proper citizens. Ice miner Sandman 1000 showed his true colors after I bumped him for non-compliance in Kamio. He was suffering from Internet Tough Guy Syndrome. 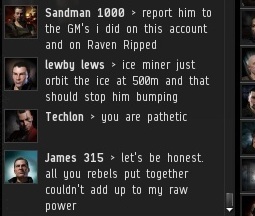 You would think highsec miners would be meek, but not always. Bumping is the cure for all ills. Sandman's untoward behavior earned him a one-way ticket out of the ice field. 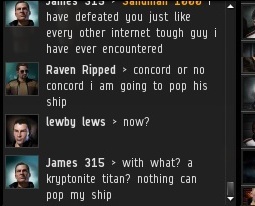 Sandman's personality changed dramatically, and he threatened to go crying to CCP. Rock-bottom status reached. He attempted to play space lawyer, but I out-space lawyered him. 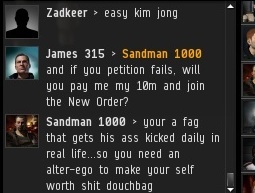 Sandman began to lose faith in his strategy, so he resumed insults. But then I discovered the identity of his alt, Raven Ripped, and sent him to the penalty zone, as well. lewby lews offered the standard bad advice, but it was for naught. The Internet Tough Guy was slain. On his alt, he threatened to suicide gank me, but he never worked up the nerve. Glory to the New Order, which brings low the haughty and raises up the pure of spirit! Since when did CCP start banning folks for Player-created content? I honestly thought they encouraged it... silly miners, thinking they can get James banned. 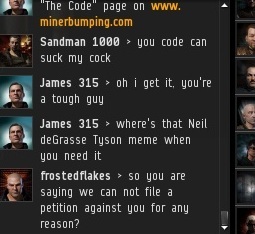 CCP should start banning people for whining about other people being creative instead. That would make the ice fields look prettier. Not only would the ice fields look prettier, it would encourage miners to embark on an endeavor of self-improvement (guided by the New Order, naturally), rather than filing petitions. You mean besides all the miners I guide? In a game designed around space piracy, this is frankly ridiculous. James315, have you considered spending some of that isk your company has generated from shares for suicide ganking? I would love to show these guys what 'ruining their enjoyment' really means. Depending on where you are Google and Yahoo remains top choices. Make sure that any search engine you choose to work with is relevant to your specific needs. Internet will be easily axis with help of customer support team. Though many of youtube video's are nothing more than cute viral clips you could live without, there are plenty you'd want to watch, even if you're somewhere with a weak or non-existent Internet connection soundcloud to mp3. Thank You for such a beautiful piece of informatio , I really look forward to get more interesting content from you.